Manathakkali or black night shade is a berry which is used widely in South Indian Cooking. We mostly dry them and add it to dishes as they are seasonal. January is the season we get this berry freshly in huge quantities however we managed to get in one shop in mylapore market (Chennai) during the month of June. The berry has a lot of medicinal values. Traditionally the plant was used to treat tuberculosis. However it is widely used in house hold if there are any stomach complaints and ulcers. 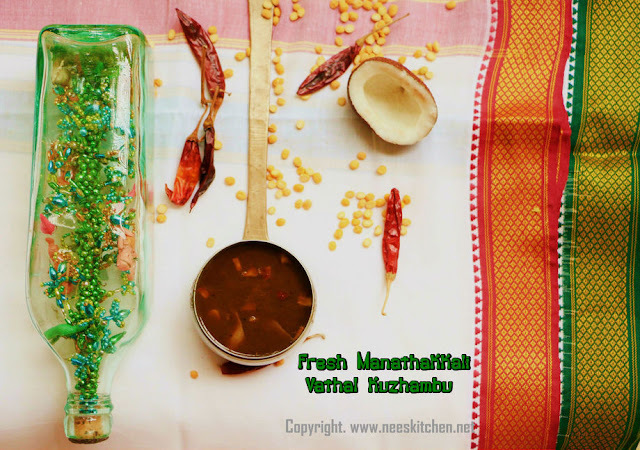 Manathakkali Vathal Kuzhambu with fresh berries is one of my favorite. Due to unavailability of this berry in all seasons I generally cook only the sun dried berry. 1. Take a heavy bottom vessel, add oil and mustard seeds. 2. Add 1 tsp methi seeds. 3. Add hing, Bengal gram dhal , tuar dhal and fry them. 4. Add peanut, dry chili and fry. 5. Add dry coconut and fry. 6. Add curry leaves and fry. 7. Add manathakkali and fry . 8. Add water to tamarind and extract the juice. 9. Add the fried mixture. 10. Add sambar powder, turmeric powder and salt. 12. Switch on the gas and let it cook until the raw tamarind smell leaves and the kulambu becomes slightly thicked. 13. Take a papad and cut into pieces. Microwave for a minute. 14. Add this pieces to the kulambu and cook for 2 -3 minutes. Manathakkali Kulambu is ready to be served with hot steaming rice. Add papad would thicken the kulambu and it is an optional step if you do not like it. Do not add too much manathakkali as it would turn the recipe bitter.